These are those events that we will never understand. All we can do is use them as reminders to live a little more fiercely than we were a moment before. Thanks!! You’re so right about that. This is a very sad day indeed! I was glued to the life coverage the entire afternoon thinking about the dead and the injured, and waiting to hear from people I know who have gone to the race. Thanks goodness my friend’s husband came in at 3:45 and he was cleared. Took her a while to be evacuated and took the subway back to the hotel. Great heartfelt post! This may sound cheesy but when you qualify for the Boston you should run it, if you don’t who ever did this horrible act wins! We can’t let a bunch of morons instill fear and terror in us! Sorry just my two cents. I was updating my site when this was brought to my attention by a co worker, the rest of my thoughts fizzled. My dream is to still run it one day and I will. I will not be fear monger d into hiding. I don’t really understand why it happened and probably never will. My heart goes out to my fellow runners. I was thinking the same thing. I had a few friends out there and they are all ok. It was terrifying to me. Such a tragedy. Scary and makes you not want to run in public. Yes it’s very unfortunate that people have to feel that way. Some of my friends didn’t even feel like running today just to train. It is just so heartbreaking! It makes me sad, sick to my stomach, and angry all at the same time. Why would someone do something so horrendous? What makes someone want to harm others? If we could all just live in peace and love one another, this world wouldn’t have to be so scary and evil. I agree with you Jessica! Only in a perfect world would it be this way though. I’m glad we share the same outlook! Thank you for your post, it’s always good to hear some heartfelt emotions, truly felt and experienced emotions, not some stuff people expect of you. Thank you for sharing, and I agree, this has been a very sad day indeed, and my heart also goes out to those that have lost so much today. Please keep on doing what you are doing, and spreading so much positive-ness. The Marines in Boston went directly to the Hospitals to give blood. There were so many heros/heroines today, all the first responders, physicians, EMTs, volunteers who were their for the race and were able to help the stricken. A sad day and so many losses. Thank you for all the kind thoughts for Boston today. L-Jay, great quote, and well needed after today’s tragedy. The horrific events in Boston today caused me to write two posts today, a first. 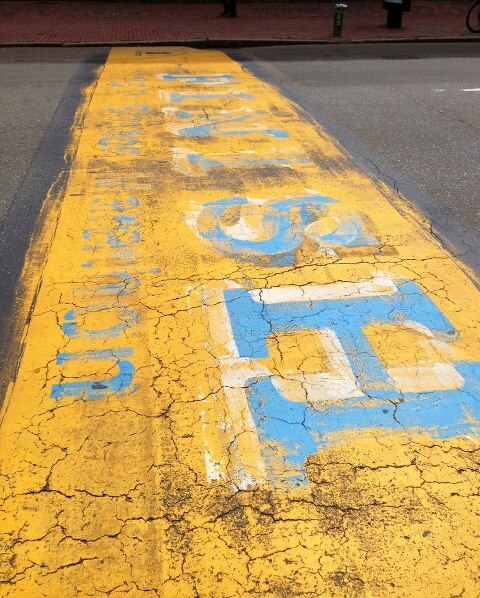 I wrote about great memories from the Boston Marathon this morning, and had to write a follow-up offering my prayers. A sad day for all. Thanks for your post. Run Boston when you make it!! Don’t let cowards acting so horrifically take away a dream, don’t give them that power. I certainly won’t if/when I qualify! Use that race to make a statement! Great thoughts and a wonderful quote….It was definitely a sad day, not only for the people directly affected by the explosions, but also for the running community all over the world. Something like this does make one question whether to enter big events like this, but then to stay away would only give those who perpetrate these deeds more ammunition. They feed on fear and as a world community we need to stand up to them. Keep on running! Don’t give up on your dreams L-Jay. Boston is something you’ve worked hard for and you should go for it. You inspire me all the time and I will pray for you. I think we need to keep running. That’s what we do. I think it will take time for everyone to be comfortable with running races again. But just as you said, we can’t live I’m fear. Reblogged this on Live Fit. This was the first thing I read this morning. I’m certain it’s helped set me up for what’s going to be a perfect day. As a child in the 80’s I grew up in an era when there was, what felt like, an ever-present terrorist threat in many of the UK’s major cities. Choosing an almost arbitrary place like a marathon in Boston seems just as senseless as the 1993 tragedy in Warrington. I just can’t comprehend how these murderers must have felt in order to justify what they were about to do. A fun day out at a sporting event, even for those who took part, is about as innocent and inoffensive as you can get. Surely, even the most deluded of fundamentalists, anarchists or supremacists, couldn’t have considered this event an appropriate target? Life for all of us, has to carry on regardless. We can’t ever lose faith in ourselves, or each other. If we do, they’ve won. I’m struggling to not feel sad and hurt by what has happened. My family has cheered me on at countless finish lines and I’ve never had to worry that they were not safe there-feel like I’ll be worried now. My heart just breaks for these victims and their families. I ran last night. It felt like the only thing I could do to feel better. I know what you mean. I’m trying my best to be “positive” about this. I’m about to start participating in organized running events and I’m afraid when I start really involving my family and friends to support me that there will be consequences. Although I’m in Canada, I’m afraid one day things like this will cross the border and start severely affecting us. I still feel so sad. I was there during the marathon expo. Good thing we were out of there when the explosion happened. It may take some time for the running community to heal but when we do, we will be stronger than ever. Stay safe guys and keep on running! Thanks alot for the encouraging words! I’m glad you are safe. There are soooo many runner around the country running strong in support of Boston! It’s a great thing to see.